When you choose to travel by train at Fiumicino, finding a low cost parking space close to the station can often prove hard to come by. However, you can always avoid the stress of finding parking by pre-booking online at ParkVia, where choosing the right parking for your needs is not only fast but simple too. With ParkVia you can book your Fiumicino station parking before you travel. For your convenience, shuttle buses run 24 hours a day to get you from the car park to the terminal in no time. The car park listed on our website is undercover, monitored by CCTVs and all vehicles are fully insured so you can relax knowing that your vehicle is in safe hands. Finding Fiumicino station parking is simple when you pre-book online. So whatever the purpose of your journey, remember you can always choose Fiumicino station parking minus the stress when you visit the ParkVia website. Fiumicino railway station is situated within the Leonardo da Vinci-Fiumicino Airport in Fiumicino, Lazio, central Italy. The station houses a passenger building, train hall and three platforms. 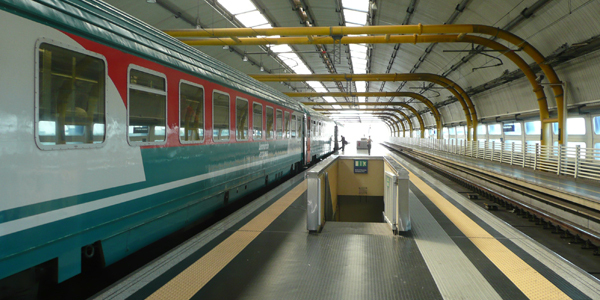 Fiumicino Airport railway station is managed by Rete Ferroviaria Italiana (RFI) and train services are operated by Trenitalia. The station is situated at Via Generale Felice Santini 11-14, directly opposite Terminal 1 of Fiumicino Airport.